The Rally to Economic Populism – Thanks to Bernie + Organizing. Hillary? It seems like overnight. Americans’ attitudes are changing on social issues – like gay marriage and the flying of the Confederate flag at state capitols. But the changes seem fast only if you ignore the centuries of slavery, Jim Crow, and repression, before that rapid “overnight” change. The flip in public opinion (or at least awareness) was often purchased by blood – and by decades of organizing. But what about economic change? How long until all African Americans – and whites and Latinos – can get a good job with a future? When will all gay and lesbian Americans – and everyone else – be able to encourage their kids to go to college, confident that they won’t have to burden them with debt, like indentured servants? And will change come fast enough to America’s carbon-intensive energy system, which now worsens climate change with every day that action to retool our economy is delayed? Now, seemingly overnight, a new populist movement addressing those economic issues is dominating the political debate. The immediate reason is the presidential campaign of Bernie Sanders, who is drawing huge crowds, raising serious money, and rising dramatically in the public opinion polls. But Bernie is also campaigning on a platform that has been developed, tested, and put on the national agenda by a generation of progressive thinkers, political leaders like Sen. Elizabeth Warren, and generations of organizers. Just as with the “overnight” changes in attitudes on social issues, activists have been working hard for years to elevate the issues of economic inequality, full-employment and economic growth, retirement security, and the question of who owns our democracy. 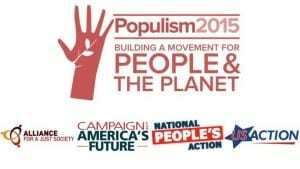 While more controversial, because the economic agenda challenges the power of corporations and big banks, polls show the agenda of the new populist movement gains the support of the great majority of Americans. 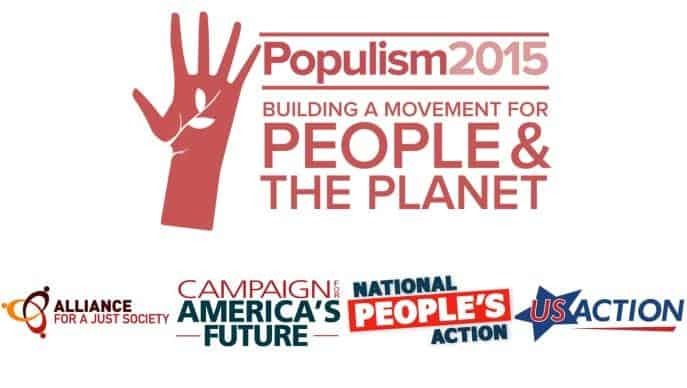 In April, at a national conference of grassroots organizers, three large organizing networks joined with the Campaign for America’s Future to release the Populism 2015 Platform for People and the Planet. The 12 planks of that platform are based on the wisdom gleaned from years of organizing by the National People’s Alliance, USAction, the Alliance for a Just Society and CAF. But it also reflected the work of activists and community leaders mobilizing people around big, society-shaping economic changes that can transform the economy in the direction of justice and sustainable prosperity. Sen. Bernie Sanders’ Economic Agenda for America: 12 Steps Forward (Dec. 2014). and the Roosevelt Institute’s Rewriting the Rules of the American Economy, by Joseph Stiglitz. 1. Rebuild America for the 21st Century and Create Jobs for All. America’s public infrastructure – from roads to rail to water and energy systems – is increasingly dangerous to our health and a drag on our economy. National investment in rebuilding America will create millions of high-quality jobs, bid wages up, help close the racial jobs gap, and make America a better place to live and work. Sanders Platform #3. We need to develop new economic models to increase job creation and productivity. Instead of giving huge tax breaks to corporations which ship our jobs to China and other low-wage countries, we need to provide assistance to workers who want to purchase their own businesses by establishing worker-owned cooperatives. Stiglitz/Roosevelt: Bring us to full employment, by increasing investments in our future. Stiglitz/Roosevelt: Provide genuine economic security and opportunity for all Americans by expanding access to the essentials of middle-class life. Stiglitz/Roosevelt: Reform monetary policy to prioritize full employment. Stiglitz/Roosevelt: Reinvigorate public investment and invest in large-scale infrastructure renovation. 2. Raise Wages, Empower Workers and Reverse Inequality. Inequality has reached new extremes, as more and more jobs become contingent and part-time, with low pay and few benefits. We should lift the floor under every worker by guaranteeing a living wage, paid sick and vacation days, and affordable health care. We should empower workers to form unions and bargain collectively. We must curb perverse CEO compensation policies that give executives personal incentives to plunder their own companies. Sanders Platform #4. Union workers who are able to collectively bargain for higher wages and benefits earn substantially more than non-union workers. We need legislation which makes it clear that when a majority of workers sign cards in support of a union, they can form a union. Sanders Platform #5. Raise the federal minimum wage to a living wage. No one in this country who works 40 hours a week should live in poverty. Reich/MoveOn: Watch Strengthen Unions here. Bob show strengthening unions is a key way to attack economic inequality. Reich/MoveOn: Watch Fight for $15 here. Bob joins a growing movement to increase the minimum wage to $15 an hour. Stiglitz/Roosevelt: Reform the labor market to ensure that everyone benefits from an economy that is working at full steam. Stiglitz/Roosevelt: Strengthen the right to bargain. Stiglitz/Roosevelt: Increase funding for enforcement and raise penalties for violating labor standards. Stiglitz/Roosevelt: Raise the minimum wage and raise the income threshold for mandatory overtime. Stiglitz/Roosevelt: Governments should grant public contracts only to corporations that meet high labor standards. 3. Invest in a Green Economy. Catastrophic climate change is a clear and present danger. The United States should lead the global green revolution that builds strong and resilient communities. Public investment in renewable energy and energy efficiency can create jobs and opportunity, particularly in communities of color that have borne the worst consequences of toxic corporate practices. Sanders Platform #2. The United States must lead the world in reversing climate change and make certain that this planet is habitable for our children and grandchildren. We must transform our energy system away from fossil fuels and into energy efficiency and sustainable energies. Transforming our energy system will not only protect the environment, it will create good paying jobs. Reich/MoveOn: Watch Make Polluters Pay here. Reich says instead of investing in dirty fuels, let’s divest from polluters, start charging them for poisoning our skies, and then invest the revenue so that it benefits everyone. 4. Eliminate Institutionalized Racism to Open Opportunity to All. In a society of increasing diversity, ending systemic racial disparities is vital to building economic prosperity. This begins with comprehensive immigration reform, expanded voting rights and an end to mass incarceration and the systematic criminalization of people of color. Reich/MoveOn: Watch End Mass Incarceration here. Bob says our criminal justice system is racist – and it’s a disaster for our economy. Stiglitz/Roosevelt: Reform the criminal justice system to reduce incarceration rates. Stiglitz/Roosevelt: Reform immigration law by providing a pathway to citizenship. 5. Guarantee Women’s Economic Equality. We will ensure that women are guaranteed the same pay, protections and opportunities as men in the workplace and in society. Families must have access to high-quality child care and paid leave from the workplace for childbirth, illness and vacation. Women must also be guaranteed affordable health care and a secure retirement – with Social Security credit for work in the household. Sanders Platform #6. Women workers today earn 78 percent of what their male counterparts make. We need pay equity in our country – equal pay for equal work. Reich/MoveOn: Watch Help Working Families here. Reich outlines key policies that will help working families succeed economically, including universal child care, paid family leave, and ensuring equal pay for equal work. Stiglitz/Roosevelt: Protect women’s access to reproductive health services. Stiglitz/Roosevelt: Legislate paid sick leave and paid family leave. 6. Provide a High-Quality Education to Every Child. Every child must have the right to high-quality, free public education from preschool to college. This requires providing the basics – preschool, smaller classes, summer and after-school programs, and skilled teachers. Free four-year, post-high school education should be available for all who seek it. We must also provide relief to the generation now burdened with a student debt that they may never pay off. Sanders Platform #8. Quality education in America, from child care to higher education, must be affordable for all. Without a high-quality and affordable educational system . . . our standard of living will continue to decline. Make college free. Reich/MoveOn: Watch Reinvent Education here. In Reinvent Education, Reich lays out six “to-dos” to fix a broken education system. Stiglitz/Roosevelt: Invest in early childhood through child benefits, home visiting, and pre-K.
Stiglitz/Roosevelt: Increase access to higher education through more public financing, restructuring student loans, and increasing scrutiny of for-profit schools. 7. Expand Shared Security for the 21st Century. No child should go hungry in America. Health care should be a right, not a privilege. Every worker deserves a secure retirement. A job should be available to everyone willing and able to work. We will strengthen and expand America’s shared security programs – Social Security, Medicare, Medicaid, unemployment, food support and housing assistance. Greater shared security makes the economy more robust by enabling entrepreneurs and workers to take risks, knowing that they can survive failure. Sanders Platform #10. The United States must join the rest of the industrialized world and recognize that health care is a right of all, and not a privilege. We need to establish a Medicare-for-all, single-payer system. Sanders Platform #11. We must strengthen the social safety net, not weaken it. Instead of cutting Social Security, Medicare, Medicaid and nutrition programs, we should be expanding these programs. Reich/MoveOn: Watch Expand Social Security here. Bob explains it’s time to “scrap the cap” so we can expand Social Security. Reich/MoveOn: In The Medicare Solution, Bob makes a stellar case for Medicare for all! Stiglitz/Roosevelt: Make health care affordable and universal – and control health care costs by allowing government bargaining. Stiglitz/Roosevelt: Increase retirement security by reducing transactions costs and the exploitation of retirees, and expanding Social Security. 8. Enforce Fair Taxes on Corporations and the Wealthy. Our tax code rigs the rules to favor the few. Multinationals pay lower tax rates than small domestic businesses. Billionaire investors pay lower rates than their secretaries. Top income tax rates have been lowered even as working people face ever-higher sales taxes and fees. It is time for the rich and corporations to pay their fair share of taxes so that we can invest in an economy that will work for all. Sanders Platform #12. At a time of massive wealth and income inequality, we need a progressive tax system in this country which is based on ability to pay. It is not acceptable that major profitable corporations have paid nothing in federal income taxes, and that corporate CEOs in this country often enjoy an effective tax rate which is lower than their secretaries. Reich/MoveOn: Watch End Corporate Welfare here. No more handouts for Big Oil, no more special tax breaks for Wall Street. Reich/MoveOn: Watch Raise the Estate Tax here. Reich makes the case for reducing inequality and generating an additional $448 billion in federal revenue over ten years from the wealthiest Americans by restoring the estate tax to the level it was in the late 1990s. Stiglitz/Roosevelt: Enact pro-growth, pro-equality tax policies. Stiglitz/Roosevelt: Enact a financial transactions tax. Stiglitz/Roosevelt: Raise the top marginal rate. Stiglitz/Roosevelt: Encourage U.S. investment by taxing corporations on global income. 9. Forge a Global Strategy that Works for Working People. Sanders Platform #7. We must end our disastrous trade policies (NAFTA, CAFTA, PNTR with China, etc.) which enable corporate America to shut down plants in this country and move to China and other low-wage countries. We need to end the race to the bottom and develop trade policies which demand that American corporations create jobs here, and not abroad. Reich/MoveOn: Taking on the Trans-Pacific Partnership. Stiglitz/Roosevelt: Restore balance to global trade agreements. 10. Make Wall Street Serve the Real Economy. Financial deregulation has devastated our economy and protected banks that are too big to fail, too big to manage and too big to jail. The financial casino fosters ever more dangerous speculation, while investment in the real economy lags. The resulting booms and busts devastate families and small businesses. We need to break up the big banks, levy a speculation tax, and provide low-income families with safe and affordable banking services. We should crack down on payday lenders and other schemes that exploit vulnerable working families. Sanders Platform #9. Financial institutions cannot be an island unto themselves, standing as huge profit centers outside of the real economy. The greed, recklessness and illegal behavior of major Wall Street firms plunged this country into the worst financial crisis since the 1930s. They are too powerful to be reformed. They must be broken up. Reich/MoveOn: Watch Tame Wall Street here. Reich lays out the case for busting up the big banks. Stiglitz/Roosevelt: Fix the Financial Sector. End ‘too big to fail’. Stiglitz/Roosevelt: Reform Federal Reserve governance. Stiglitz/Roosevelt: Regulate the shadow banking sector and end offshore banking. Stiglitz/Roosevelt: Bring transparency to all financial markets and enforce rules with stricter penalties. Stiglitz/Roosevelt: Reduce credit and debit card fees. Stiglitz/Roosevelt: Expand access to banking services through a postal savings bank. Stiglitz/Roosevelt: Rebalance the rules for bankruptcy by expanding coverage to homeowners and students. 11. Change Priorities to Address Real Security Needs. Our current national security policies commit us to policing the world. The result costs lives and drains public resources. We need a real security policy that makes military intervention a last resort, and focuses on global threats like climate change, poverty and inequality. We should reduce military budgets and properly support humanitarian programs. 12. Fight for Democracy and Curb the Power of Big Money. From big-money politics to the assault on the right to vote and a corrupted lobby culture in Washington, our democracy is under assault. It is no accident that the assault has escalated as a new majority of people of color, young people and working women has begun to emerge. We need to close the revolving door between Wall Street and Washington, and expose the entrenched interests that buy our legislators. We need public financing of elections that bans corporate and big money. We must guarantee the right to vote, with easy access to registration and the polls. New York Mayor Bill de Blasio’s “Progressive Agenda,” aimed at income inequality. The Center for Community Change’s Putting Families First: Good Jobs for All. The Economic Policy Institute Project on Raising America’s Pay. And of course, the Progressive Caucus’ The People’s Budget. The Center for American Progress’ Commission on Inclusive Prosperity report, chaired by former Treasury Secretary Larry Summers. “All of these are bold efforts to address the central issue of the day: an economy of increasing inequality that does not work for working people. All call for major long-term public investment to rebuild America’s infrastructure and put people to work. All advocate progressive tax reforms to hike taxes on the rich and corporations. Virtually all want a new trade policy that will deal with currency manipulation. All call for extensive reforms to insure that the rewards of growth are widely shared: raising the floor under workers (hiking the minimum wage, guaranteeing paid sick days, vacation days and family leave, adjusting overtime, etc), empowering workers to form unions and bargain collectively and rolling back the excesses that have bloated CEO pay packages. All put basic equity at the center of economic growth – immigration reform, an end to mass incarceration, pay equity for women. Virtually all call for major investment in education from universal pre-K to affordable college. Most envision an expansion of Social Security, affordable health care, and other shared security programs. These platforms are bold progressive calls for government action to fix the rules that have been rigged to favor the few. All argue that inequality is not inevitable, not an act of nature, but a product of policy and of power. And no matter who gets elected progressives are going to have to keep pushing hard – and building a movement – around the evolving comprehensive economic agenda for justice and prosperity.